Alappuzha town of Kerala has an intricate network of canals originally constructed for inland water transportation. The canals over a period of time has turned into sewers owing to indiscriminate dumping of solid and liquid wastes. From 2012, the town became an example of effective decentralised solid waste management and received recognition from the United Nations Environment Programme (UNEP) in 2017. The state of liquid waste management however remains deplorable with the canals eutrophied by excess entry of nutrients. To explore a practical and sustainable solution the Indian Institute of Technology-Bombay (IIT-B) and Kerala Institute of Local Administration (KILA) started working in Alleppey from December, 2017. Starting with a Winter School to train engineering students on open access data collection and mapping tools, the team developed a methodology for assessing physical and socio-economic characteristics of the canal system. Inspired by the success of Winter School-2017, IIT Bombay and KILA conducted a Summer School in May, 2018 in Alappuzha in partnership with Cochin University College of Engineering, Kuttanad (CUCEK), Consortium for DEWATS Dissemination Society (CDD), Bengaluru and the Inspiration Kochi to explore the technology solutions with more than 300 students from all over India. The recommendations from Winter and Summer Schools led to the development of a socio-technical plan, which was finalised after a multistage vetting process. The plan as a pilot being implemented in one canal is nearing completion. This pilot project will help in understanding the strengths and weaknesses in the design and execution of planned interventions before scaling up to other canals. conservation. It has also opened up a line of communication and cooperation between various public and private institutions. 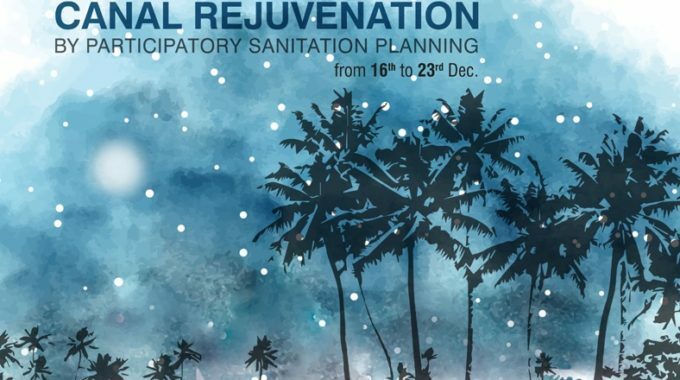 It is at this point in time that we embark upon Winter School-2018 to provide a platform to participating students to interact with and learn from the experts, peers, practitioners and local people in order to understand the complexities of water and sanitation issues in managing the urban water bodies. The school, structured as a week-long course, will focus on class room lectures on fundamentals of wastewater and solid waste management; key policy/regulatory constraints; training on tools and techniques for data collection, survey/analysis and hands-on integrated sanitation planning with fieldwork. The Winter School-2018 will be a rare opportunity for young graduates (future practitioners) to become part of the policy making and implementation processes and will conducted from 15-Dec-2018 to 23-Dec-2018 in Alappuzha. 23 afternoon. Boarding, lodging and local travel will be provided by the organisers. Travel to and fro from the venue should be borne by the participant. We look forward to having you at the Winter School-2018 in Alappuzha, Kerala.